What does Tom Kha Gai mean? Easy Tom Kha Gai Soup or Thai Coconut Chicken Soup is definitely one of the more famous Thai dishes. 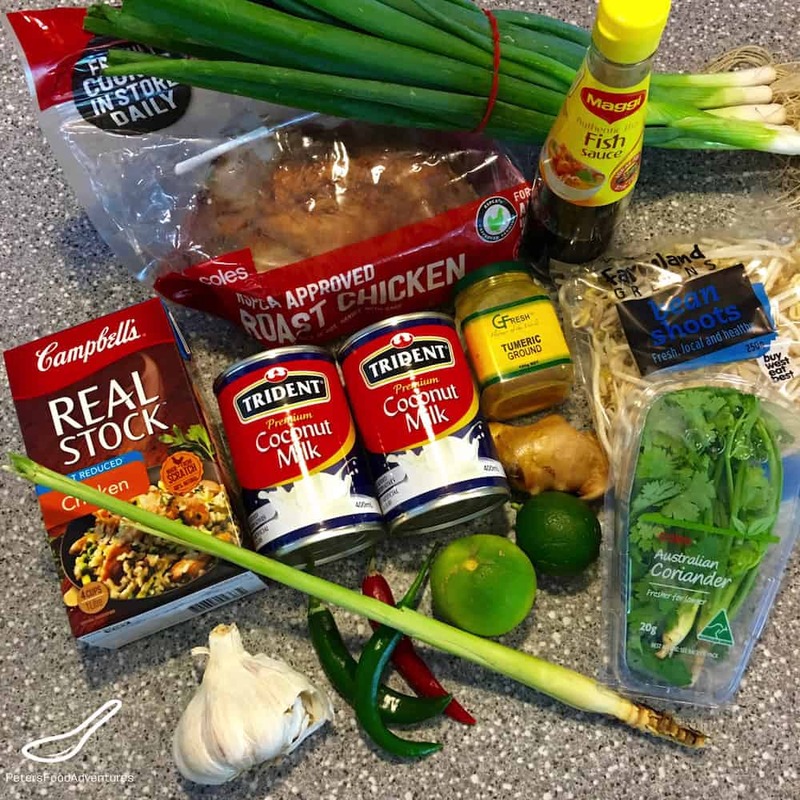 It’s a delicious spicy and sour soup made with all the Thai staples you would expect: lemongrass, fresh ginger, chilli, lime and coconut milk. It’s one of my wife’s favorite dishes, and this recipe is one we make often when we are in a hurry, but still need to feed the family a real nutritious meal. The Thai word Tom refers to the boiling process, such as the soup. Kha means galangal in Thai, which is a rhizome similar to ginger, but it taste more piney and citrusy. It’s hard to find, but I have more about that below. Gai means Chicken. All together it translates to Chicken Galangal Soup – but often referred in English as Thai Coconut Soup. This soup is adapted from an old Australian Women’s Weekly recipe in an cookbook we were given about 18 years ago. What I love about this Tom Kha Gai Soup recipe is how quick and easy it is to make. Every supermarket sells already cooked roasted chickens, which is the ‘easy’ part of this recipe. After a long day of work, I don’t always have time to make and elaborate dinner. This is a tasty and nutritous meal, that you can quickly throw together in about 30 minutes. I think it’s easier to shred a flavored roast chicken, saving you time, instead of chopping raw chicken and frying it. As much as I prefer to make my stock from scratch, sometimes life happens and you need to make a meal in a hurry. Using stock from Campbell’s soup works great in a pinch, but homemade stock always tastes better. What does Thai Chicken Coconut Soup Taste Like? 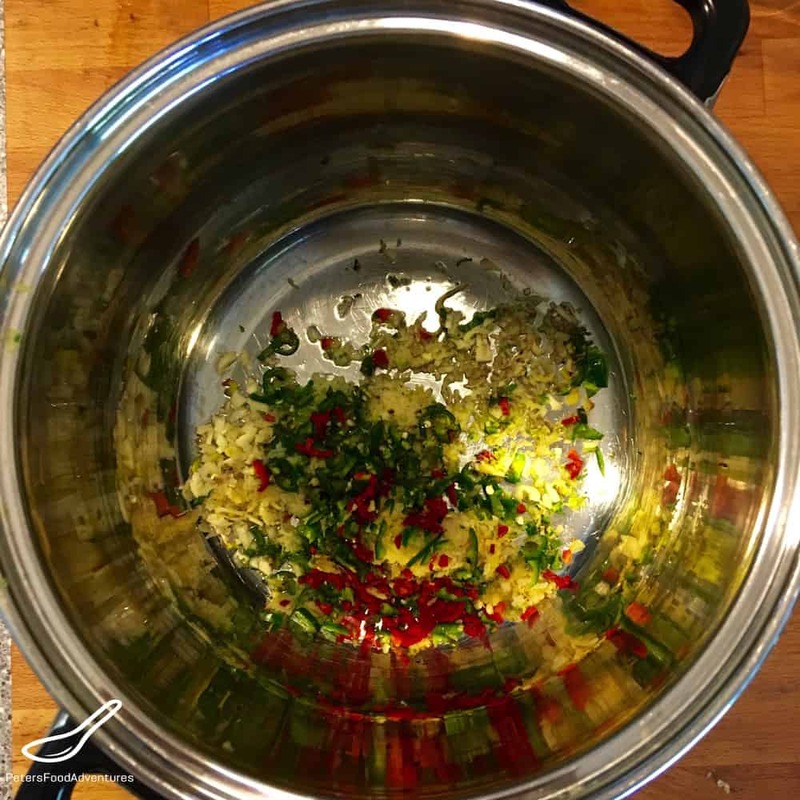 This recipe incorporates classic Thai flavors, such as lemon grass, ginger, garlic, fish sauce and cilantro. I love the flavor cilantro gives in Thai cooking, but I used to hate cilantro. Some people say it tastes like soap, up to 10% off the population. There are some genetic factors that cause it, but I have learned to love cilantro. If you hate cilantro, then leave it out of the recipe. I love this creamy chicken soup! I usually have most of these ingredients in the fridge, including fresh limes from my lime tree in my garden. Traditionally, Tom Kha Gai Soup has galangal root in it, which sometimes I have a hard time finding, and it’s definitely not in my fridge. Even without galangal, this Easy Tom Kha Gai recipe has amazing, authentic flavour. Cooking with 3 Thai chilli peppers can be too spicy for some, make sure you carefully de-seed them, and cut down to 1 or 2 chillis, if you need a kid-friendly soup. 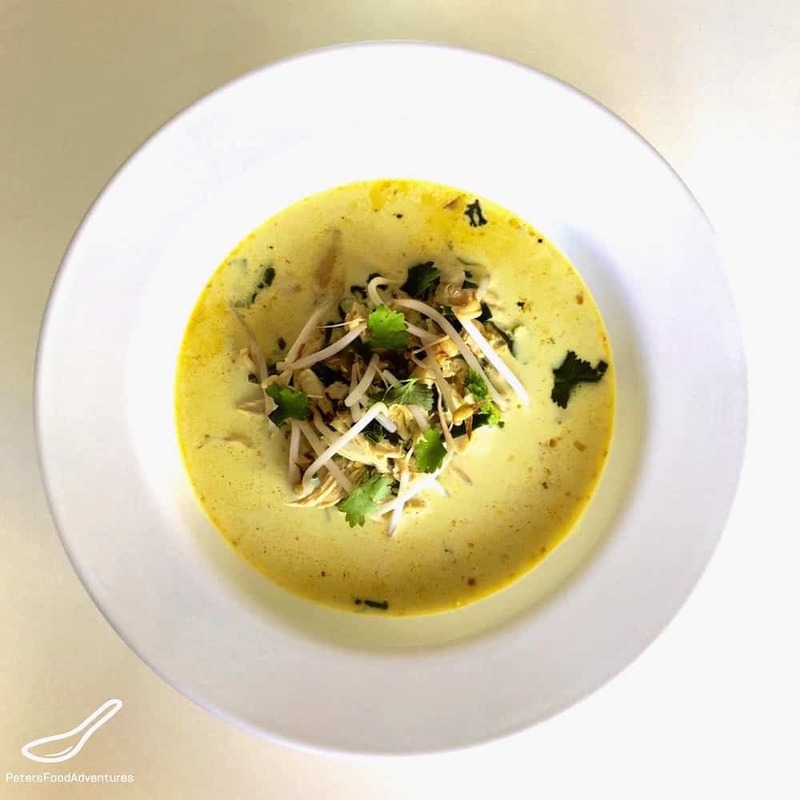 This delicious and easy Tom Kha Gai Soup (Thai Coconut Soup) with authentic flavours is perfect to make when you’re in a hurry, and makes a great exotic change from regular soups. (Unless you are Thai, then this is just a regular soup to you). Bon Appetit! Приятного аппетита! 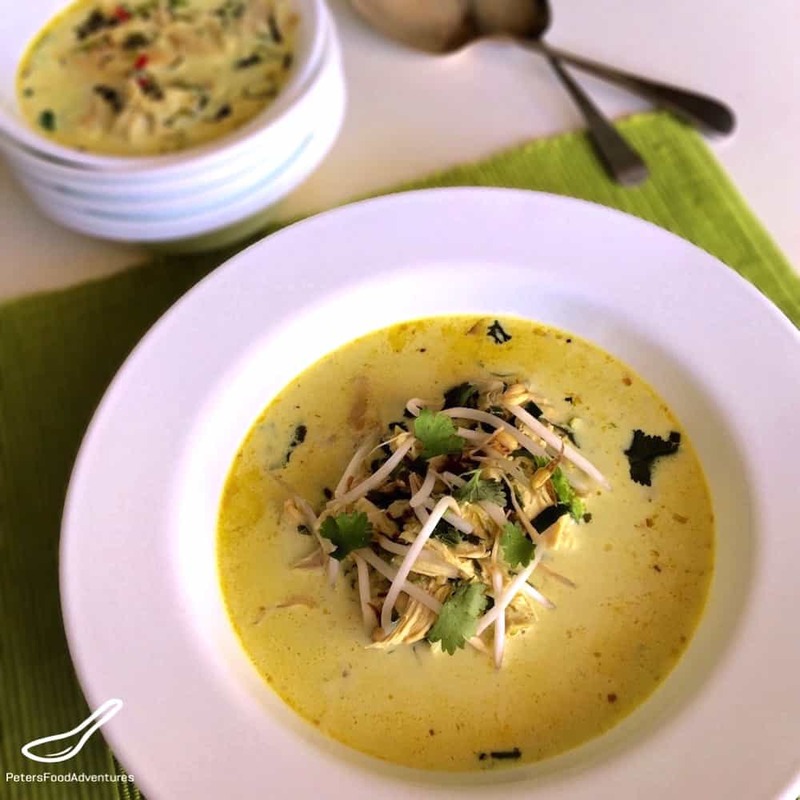 Easy Tom Kha Gai (Thai Coconut Chicken Soup) An easy to make recipe, authentic and delicious made with coconut milk. A Thai classic that's ready to eat in 30 minutes! Heat oil in a large stockpot. Cook lemongrass, ginger, garlic, chilli, turmeric and cook for about 2 minutes until it start to be fragrant. Stir in the coconut milk, chicken stock, water, palm sugar and fish sauce. Bring to a boil then add the chicken. Reduce heat and simmer for about 10 minutes. When you are ready to serve, add green onions, lime juice, lime zest and coriander. Garnish with a handful of bean sprouts and coriander/cilantro. 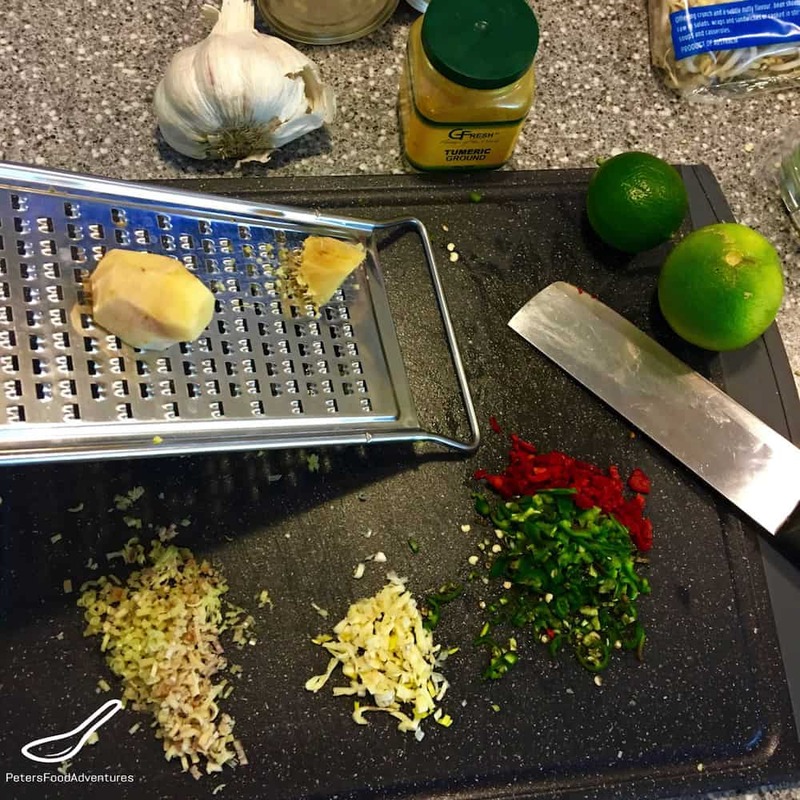 Instead of Lemon Zest, you can use 4 Kaffir Lime Leaves chopped finely, fried together with the garlic and chilli. It's sometimes hard to source, so I find the lime zest works really well as a substitute at the end of the meal. « Russian Tea Made From Scratch! Easy to make when in need of time! Fun to take your time for when you have the time! Think I’ll make this next time I make some chicken on the bbq! The leftovers will do great in this recipe I think! Haha! Yes, leftover chicken works great! I find that when I use a whole bbq chicken, the soup turns out very meaty, which is what i love. Some people might like less chicken in it. 🙂 Enjoy Chicken Sunday! Looks fantastic! Reminds me of our Thailand vacation, and is easy to make, done! ???? Love love love Asian food and especially that soup!! Yes, love how easy it’s to make as well. ??? ?